We sell unique tribal kilims, sumaks (soumaks), cicims (jijms), sofras, and carpets as well as jewelry from Turkey, Central Asia, and Persia. We will ship anywhere in the world. We have selected an unsurpassed collection of unique rugs, carpets, kilims, tribal textiles, jade, turquoise, lapis, & silver tribal Turkmen jewelry, earrings, and other art including unique sumak cushions. 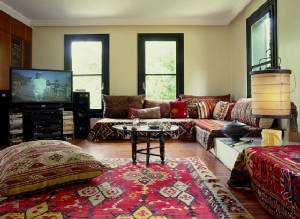 Here, you can also learn about the history, techniques, and connoiseurship of fine rugs and textiles. From the Far East to Anatolia exists a single culture area, a dreamland of unique art and culture, represented in our lives by the accidental meeting and subsequent marriage of a Turkish man--a one-time shepherd and tribal art expert-- and a Japanese woman, a Near Eastern archaeologist. We enjoy sharing our passion for Turkish culture and artifacts, both through information and by making available unique art pieces from across this vast, exotic land. Please peruse our following pages for currently-available new, semi-old, and antique handmade flat-weave kilims, brocaded sumaks, and pile carpets, as well as textiles such as suzani, antique kilim fragment cushion covers, purses, and jewelry shipped directly from us to you. We have been recommended by foodvacation.com as well as many satisfied customers! If you are planning to visit Istanbul and looking for a place to stay, please consider our newly renovated short-term rental apartment, Topkapi Apartments, located in the heart of Sultanahmet. Visit us at Noah's Ark Carpets and Kilims at Divanyolu Caddesi, Ticarethane Sokak, No. 5A, Sultanahmet, Istanbul. The earliest reference to Turks appear around 200 BC in Chinese records. These hunters and nomadic shepherds tending sheep, horses and sometimes camels, living in Altai bequeathed an extremely interesting culture to their descendants, the basic features of which have been handed down from the early beginnings all the way to the present day. With our head office in Istanbul, we are happy to ship worldwide and have both European and North American representatives. 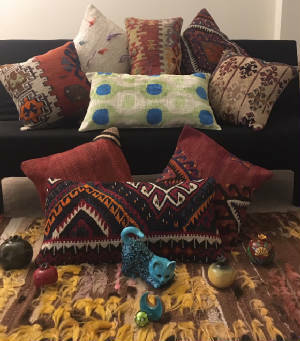 We can also assist in the production or location of textiles for specific needs, and we have advised numerous collectors on both starting and augmenting investment-grade kilim, sumac, and carpet collections, including old and antique pieces. We also provide rug repair services. I am originally from central Turkey, the region of Cappadocia, in the town of Nigde, where my grandfather was in the rug business. My family was semi-nomadic and I grew as a shepherd, while my mother and sister wove rugs. 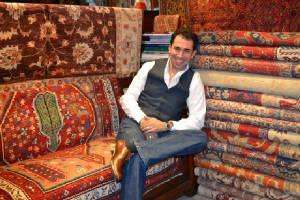 I came to Istanbul when I was twelve years old and started working in a carpet repair shop. This is how I got my start in the carpet business. After training for several years as an assistant, I became a salesman in Noah's Ark carpets and Kilims when I was eighteen, the youngest salesman in the history of Sultanahmet, the historic area of Istanbul. After a 18-month mandatory military training, I returned to Noah's Ark in 2001 and have been there since as a partner of the store. Several times a year, I travel around Turkey purchasing carpets from the weavers themselves to ensure fair-trade practices. I also make it a point to share with them how much their workmanship is appreciated by many around the world and encourage them to keep their art alive passed down from mother to daughter. I believe handmade carpets with their incomparable colors and designs fill people's homes with positive energy and give joy to the people who use them. If you are interested in any of our items, please e-mail us. Most of the carpets will be sent by normal Parcel Post (4-10 days), unless specified.